This is hysterical! My buddy Laura and i were sitting in the office hating on our jobs when RJ sent me this link (I'm not get savvy enough to post videos on my blog, so you'll need to cut and paste.) You have to listen to this guy. He is a Texan who isn't happy with Jimmy Dean Sausage's new packaging. My job really could be SO much worse! Company photo! (minus the Pres. 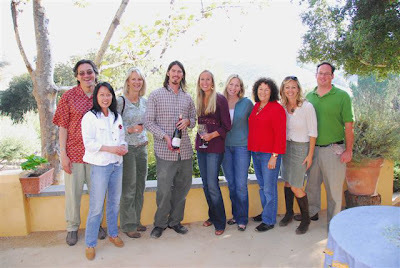 Danny and plus a long-haired wine guy from Santa Ynez.) Laura is the blond on my right.